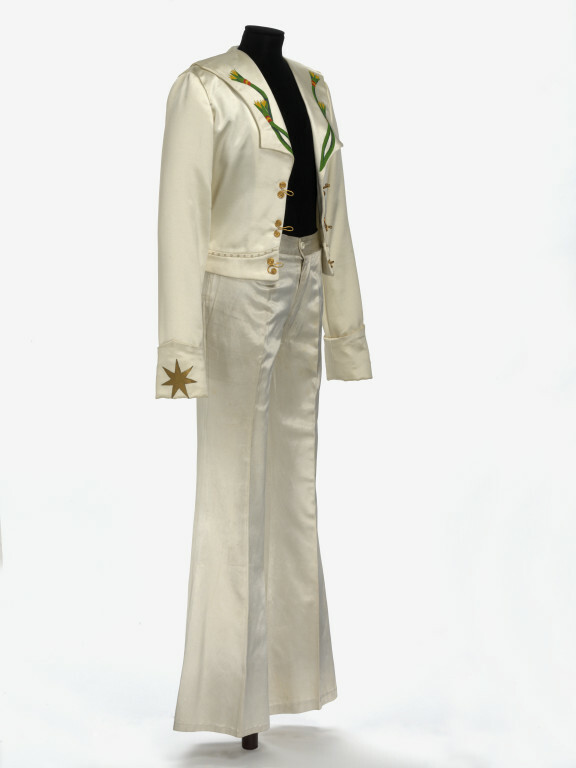 This stage costume, worn by Jimmy Page, guitarist of Led Zeppelin, is known as the 'Egyptian' costume because of the symbols prominent on the back of the satin jacket. These symbols are more than just decoration, however, reflecting Page's interest in the occult, and particularly the teachings of early 20th Century British occultist and writer Aleister Crowley. The Eye of Thoth, within the triangle, represents the ancient Egyptian God of writing, magick and learning; he is considered the patron of magicians and sages. The Egyptian woman is Nut (noot), Goddess of the sky; Aleister Crowley claimed that she revealed herself to him in 1904 as Nuit, the personification of infinite space. The winged disk emblem is found in many ancient cultures around the world; some believe the depiction of the winged disk is based on the appearance of the sun's corona during a solar eclipse. 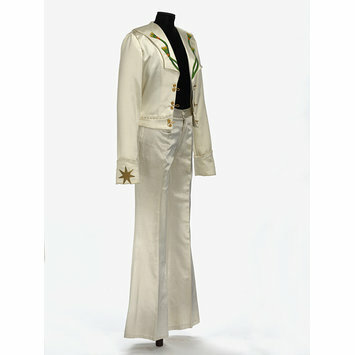 As well as having meaning in the symbols, the ivory satin costume itself would have been highly eye-catching; Page's wild performance style was reflected in his stage outfits.